When you are looking for ways to create the perfect backyard often times we let our dreams of our ideal space be fall to the wayside. Homeowners need to realize that what makes their version of the perfect outdoor living space right for them comes from within. No two people view the idea of outdoor living the same way, that being said we specialize in customizing your dreams to suit your desired function within that space, the area you have available to create your space and your budget. 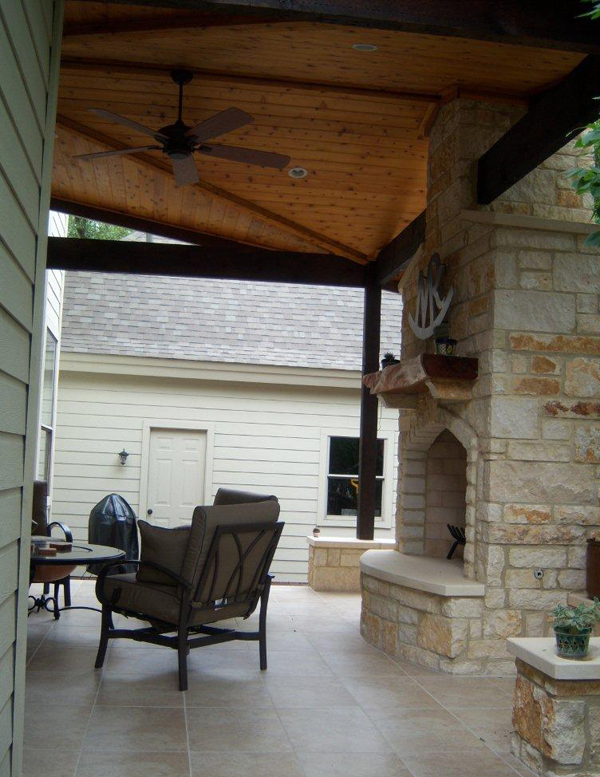 A covered patio, deck and pergola may fit the bill for your backyard. We have compiled a list of the top 10 ways to create that outdoor oasis you have been dreaming of. This list will help provide ideas and insight into how you can make your outdoor oasis a reality. This Circular spa with natural privacy barrier has clean lines and delivers a contemporary feel to the space. 1) Pick you own personal style – create a backyard that flows with style. Create everything from formal by using columns and classic lines, to more modern by using curvilinear edges on your patio or deck edge, sticking to monochromatic color palettes and even introducing metal into the mix. If you can’t decide on just one style, then you can use a combination of well-chosen elements for an eclectic unique look. 2) Embrace textures – this maybe the most crucial design element that is often overlooked when building an outdoor living structure. By mixing wood, composite, stone and other hardscape materials together within your design, you create a feast for the senses. Combining a hardwood deck in combination with a flagstone patio will leave you with a space that begs to be lingered in. On a simpler note, even adding a pergola of rough-hewn cedar in conjunction with a hardscape feature will provide the same stunning contrast. 3) Be creative – outdoor living design is not black and white. There are no set rules, so go ahead and think outside the box. Employ the use of unexpected design opportunities to add visual interest. From adding a seating wall around your fire pit to placing deck lighting in an unusual spot to create ambiance, these details make the difference. A little creativity goes a long way. 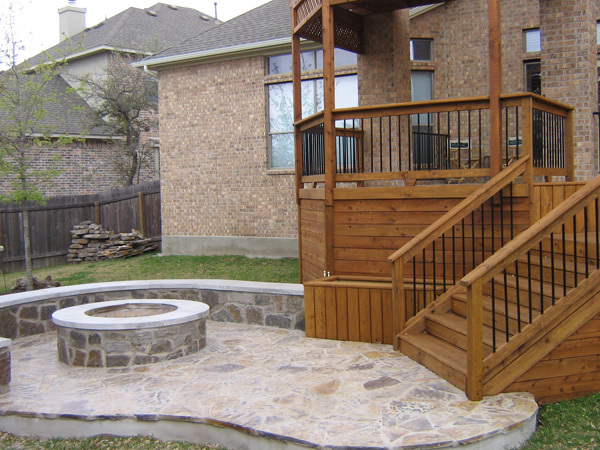 This Flagstone patio with fire pit, bench retaining wall and adjoining deck shows how mixing textures can produce a lovely outcome. 4) Work with what you have – take a good look at your backyard and cultivate your outdoor living space with ingenuity. Mature trees, a spectacular view, or the slope of your yard can all be used to your advantage to get the most function and enjoyment out of your outdoor structure design. 5) Live outdoors and still have privacy– by designing your backyard with intimacy in mind; you can still have a highly functional outdoor space that offers privacy. Retaining walls and privacy walls are a great asset to your space and add a way to keep prying eyes away. This can also be achieved through landscaping methods, such as borders that can add color and lush foliage to your space too. 6) Choose your function – in order to get the most from your space, it is important to decide what you want the primary use of your space to be. Entertaining, cooking and dining, relaxing and even a need for a shaded area are viable reasons to choose one structure over another. If you intend to use your space for multiple functions then a design that includes multiple outdoor areas that offers separate designated functions may be your best choice. This Reading nook on Tigerwood multi-level deck at canopy level provides a place for intimacy and to spend quiet moments. 7) Borrow upon the elements of nature – the 5 elements of nature are water, metal, earth, wood and fire. By using one or more of these elements in your outdoor space you will create an atmosphere that blends with your backyard. An outdoor fireplace or fire pit adds an intoxicating feel to any outdoor design. The flame, the sound and the warmth bring out some primitive instinct that makes us want to be near it. Water plays on our senses in much the same manner. By adding a water feature such as a rock waterfall into your outdoor space, you will hear the soothing sounds of moving water on a regular basis which relax and renew. 8) Decide the amount of maintenance your material choices will require– many times homeowners convey their wishes to use certain materials without realizing the amount of maintenance their structure will require. 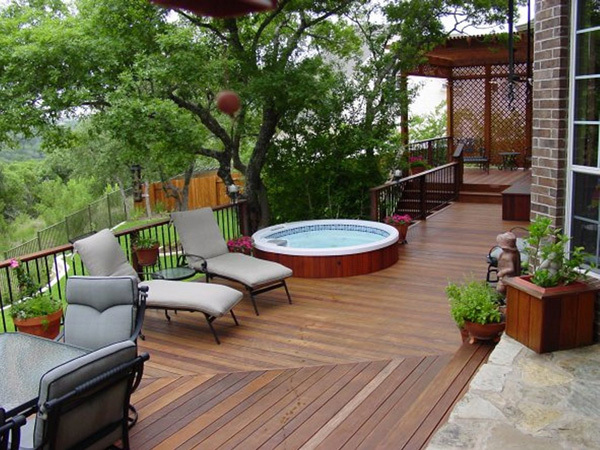 For example an Ipe or Tigerwood deck requires annual maintenance, and sometimes more frequent in certain climates, to keep the wood looking new. In order to maintain your structure to get optimum results, it is important to decide the amount of time you are willing to put forth to maintain your investment. Many of the materials we have available require little or no maintenance and will remain looking new for many years to come. 9) Create an outdoor room – screen porches, covered patios and 3 season rooms can now be treated as an outdoor room with all the functionality and creature comforts that an interior living room can provide. Outdoor kitchens, fireplaces, ceiling fans, outdoor televisions, recessed lighting and plenty of electrical outlets are some of the many options available in outdoor structure design. The hardest part is deciding what you want to include in your space. 10) The details make the difference– an outdoor structure without decorative accents or outdoor furnishings that individualize it is just an empty shell without character or personalization. By choosing furnishings that offer comfort and style to your space you will want to use it more often, and so will others. A comfy outdoor sofa with overstuffed cushions will create a place that you will never want to leave. The small touches that put the icing on the cake are the decorative touches like planters placed on your new deck stuffed with beautiful foliage and blooms, or maybe a reclaimed architectural piece placed as a focal point; these things are the glue that binds the perfect outdoor oasis together. Whether you are ready for a new deck, yearning for a quiet spot to keep the sun off of you so you can read in the garden, or are ready to transform your entire backyard with an outdoor living combination structure, we can make it happen. Outdoor living is all about fun, friends and family; to us outdoor living is personal. Contact Archadeck of Austin to learn what the stuff of dreams are made of. See more inspiring images of other outdoor living areas by visiting our shade gallery, outdoor living gallery and patio and hardscapes gallery located on our website. This entry was posted on August 16, 2012 by austinporchandpatio. It was filed under Austin fire pits, Flagstone, Multi-structure outdoor living areas and was tagged with Archadeck of Austin, Archadeck of Austin design, Austin Cedar Pergolas, Austin covered patios, Austin flagstone patio, Austin flagstone patios, Austin Ipe decks, Austin outdoor fireplaces and fire pits, Austin tiger wood decks, Austin tigerwood decks, Austin water features and stone waterfalls, Creating your own outdoor oasis in Austin TX, Custom fire pits, Unique patio designs Austin TX, Water features.